This instrument shows what I can do with a "terminal" case. 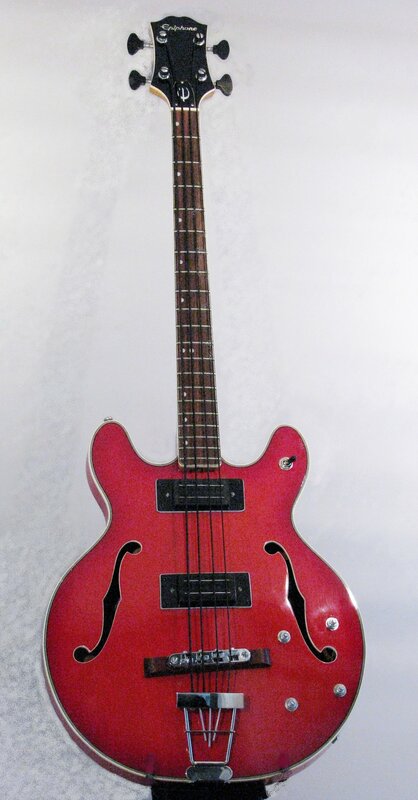 This short scale, out of production Epiphone had a loose neck and splitting seams. It had lost its tone bar (like a violin has inside between the top and back under the bridge), no tailpiece, no bridge, one pickup, and grinding tuners. At the end of the rebuild, unplugged, with a set of nylon flat wound strings this restored 16" hollowbody bass has acoustic 3/4 upright sonic aspirations, but sings through an amp with a super smooth jazz tone. I believe that Gibson/Epi "evolved" this bass into the Jack Cassidy signature bass. This instrument could be reinvented in a fashion similar to my Manhattan or Royal series electrics. At face value this is what it seems to be, and sounds just like it ought to sound. The back story ads clarity to the confusion. The body was a "salvage", found on an internet parts site as a violin shaped box.... just the box, and no clue to what was inside structurally. Aftermarket parts are available, but no necks, tuners, and, at first, no plans to work from. I used photos and scaling techniques I'd learned in scale modeling to reverse engineer the neck dimensions. I wanted to use Hofner's original raised fingerboard ('62 and earlier) but the short neck tenon is known to be fragile. I used a proven dovetail joint like my archtops. As I finished the work, I located plans which confirmed my work within a millimeter of the original basses. The superb sunburst was applied by Gerhard Guitar Works, so the end result is a very authentic reproduction at roughly 1/3 less than the current top tier re-issues. 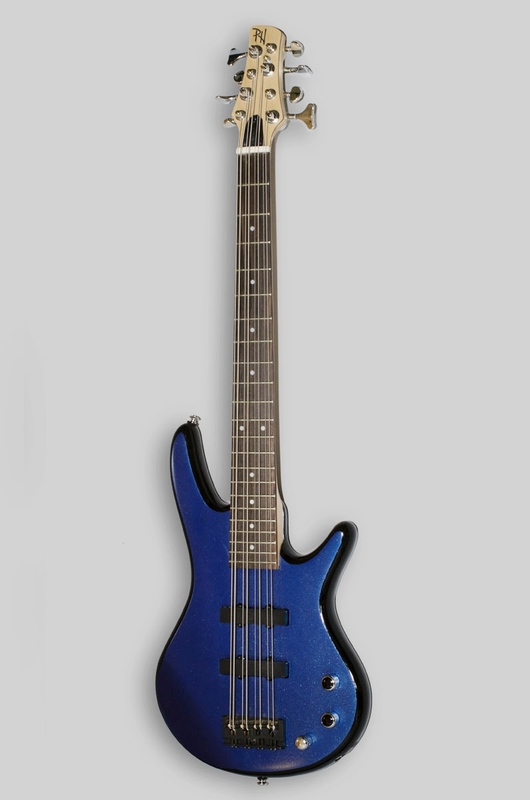 This compact sapphire gem began life as an Ibanez 5 string bass. Adding a metal flake blue finish for visual punch. My bassist is a Steinberger collector. He has commented that this bass plays as easily as a standard 4 string bass. Full, Beautiful, and ethereal 4 course octave sound without pedals. My bassist, Danny, asked me to create a 5 string bass for him so that he could leave his prized Steinberger safe at home, but there were requirements. It had to sustain. It should use standard strings. It shouldn't need batteries, and most difficult...the string spread should be as close to the Steinberger's 2 1/4" as possible. We didn't want to use Steinberger parts. Prototype 1 is a 34" scale neck-though core of maple, cherry and bloodwood, with hollow wings of figured maple and sapelle. ABM hardware is used with passive Delano pickups and a pull out boost switch in the tone knob. String spacing is 2 9/16" at the bridge (no good for Danny, but is standard 5 string spec), Fender 5 string spacing at the nut. LIGHT, fast, and deep throated tonally, with extra sparkle in single coil mode. Here's the back of prototype 1 clearly showing the neck through core. As part of my experiments toward Danny's Bass, this prototype utilizes standard Hipshot light weight tuners with Hipshot individual saddles. Pickups are a powerful, rich sounding passive set from Seymour Duncan. String spacing is standard Fender 5 string at the nut, 2 9/16" at the bridge. 34" scale neck through core is cherry, mahogany, and maple with hollow wings of Curly cherry and a sapelle core.